OVC/OVCE Spring Concert: Something Old, Something New, Something Borrowed, Something Blue! OVCE Provides the music for the 9am and 11am services of our rehearsal facility, First Unitarian Universalist Church! The musical representation of American nationalism is found not only in our Appalachian folk songs and or spirituals, but in Jazz and our patriotic songs. Featuring compositions by William Billings, Aaron Copland, Charles Ives, and Leonard Bernstein as well as Cole Porter and George Gershwin among others; OVC's spring concert, A Slice of Apple Pie: Songs Representing the American Spirit, will join our American musical styles together as we prepare to celebrate America's birthday. 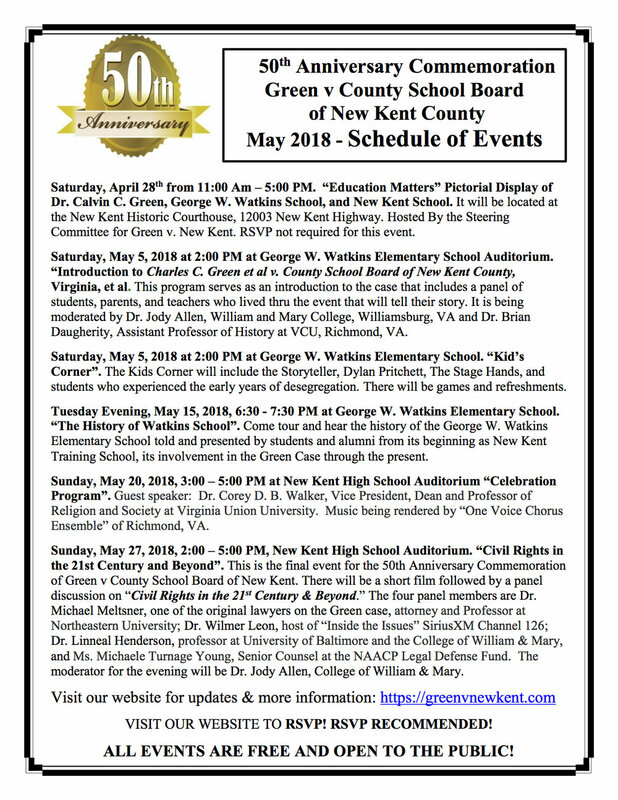 OVCE will perform at a special event to celebrate the 50th anniversary of the Green vs. New Kent Co. case, which helped to end the practice of segregated schools in the Commonwealth of Virginia. For more information on this event, as well as the other activities that will take place during the festivities around the 50th Anniversary of Green Vs. New Kent, Please see the poster below! Charles Albert Tindley's call to action, "Take courage my soul, and let us journey on..." sets the theme for OVC's Spirituals Concert! Take Courage, My Soul-Spirituals of Strength features the music of Moses Hogan, Rollo Dilworth, Barbara Baker, as well as the beloved Alice Parker, who at age 93 is still composing the music of the American folksong and spiritual traditions. Whether it is accompanied or a cappella, slow or fast, OVC will certainly provide you with words of strength to stand beside us as we sing the Beauty and Power of Diversity! The works of the great American musical theater composers is the focus of Broadway Revisited, is the focus of OVC’s spring presentation. Featuring selections from South Pacific, Show Boat, and West Side Story, this concert is sure to please every person who loves the music of the Great White Way! Of course, OVC brings attention to the lessons of Diversity and Inclusion through its unique concert crafting, which will be on display. We also invite you to arrive an hour early for our signature pre-concert discussion, Harmony in Living Black and White, in which Bill Cooper facilitates a conversation among our audience members that addresses how to live more harmoniously in an increasingly diverse world. OVCE has been invited to perform in the Bruton Parish Church's Candlelight Concert series for a second time. We are so excited to have this opportunity to combine our brand of spirituals and choral classics with sacred music appropriate for this historic venue. CONCERT DETAILS: 8:00PM, Free Admission. Free Will Offering is taken to benefit the Candlelight Concert Series at Bruton Parish Church. OVCE Will present its signature sound in concert at the Chester Branch of the Chesterfield County Public Library. Spirituals, Concert works, as well as lighter fare will be presented as we strive to Sing the Beauty and Power of Diversity in our home area . One Voice Chorus Ensemble is excited to announce that it will make its first appearance at the Black History Museum and Cultural Center of Virginia! Please join us on April 7 as we help to celebrate RVA First Friday's with the museum. The event is 5:00pm-9:00pm with guided tours will be available at 6pm and 8pm. OVCE will perform at 7:00pm. CONCERT DETAILS: 7:00pm concert. Free Admission. Please join One Voice Chorus as we present Let My People Go featuring Robert Ray's Gospel Mass. Contemporary composer Robert Ray is one of the many champions of music that celebrates the African American heritage. His Gospel Mass, in addition to the music of Moses Hogan, Rollo Dilworth, and Rosephanye Powell, among others shapes our African American experience presentation. OVC dedicates this production to the memory of the lives lost in the ongoing fight for justice in the United States that became unavoidably apparent during the summer of 2016. In its first concert presentation for the Charlottesville community, OVCE Will present a concert to celebrate Black History Month at St. Paul's Memorial Church. Presenting anthems, classic and contemporary spirituals, as well as portions of Robert Ray's Gospel Mass; this presentation of the African American Musical Heritage will please all. CONCERT DETAILS: 7:00PM, Free Will Offering to benefit the work of One Voice Chorus. Looking for a fun, family friendly outing that also supports OVC during the winter rehearsal hiatus? Look no further! One Voice Chorus Ensemble will be spreading holiday cheer at two Sweet Frog locations! Come out to Sweet Frog in Atlee (10040 Sliding Hill Road) Monday, December 12, where OVCE will be caroling from 6:30 pm to 8:30 pm. Sweet Frog has generously agreed to donate a portion of the proceeds from the Yogurt sales made during the caroling, back to OVC! Come on out for that Monday night, after dinner treat and enjoy some great carols! If the date and location are not convenient, there is another opportunity to support OVC. Sunday, December 18, 4 pm - 5 pm at the Sweet Frog location in Carytown (3137 W. Cary Street). Once again, Sweet Frog has generously promised a portion of the proceeds from Yogurt sales during the caroling will be donated to OVC. What better way to spend a Sunday afternoon than listening to great carols and enjoying a treat from Sweet Frog! Don't forget to share the news with all of your friends!!! Enjoy an enchanting holiday evening at Maymont…by moonlight! A horse-drawn carriage ride under the stars, seasonal refreshments and joyful carol singing by One Voice Chorus Ensemble by the bonfire. Elegantly costumed Victorian ladies and gentlemen welcome you to the home of Major and Mrs. James H. Dooley to witness the excitement of Christmas 1893. The Dooleys’ gracious family, guests and domestic staff bring to life the busy preparations for a special celebration – the first Christmas in their new home truly and evening to remember. George Frederic Handel's "Messiah" is a holiday staple. One Voice Chorus and the Petersburg Symphony, under the direction of Ulysses Kirksey, will partake in a joint venture of this epic work. In addition, local outstanding quest soloists will accompany the choir and orchestra. Join us for and aural representation of Franz Joseph Haydn and Zoltan Kodály’s responses to political and social upheaval through their compositions, Missa in Angustiis and Missa Brevis. Arrive an hour early for our signature pre-concert discussion.